After my short but pleasant stay in Sao Tome, the next day, October 18th, I taxied out for a modest five hour flight to Abidjan. I had heard that this is a favorite "tech stop" for ferry pilots, with relatively cheap gas, and a fairly manageable bureaucracy. I arranged for a two night layover, as I also wanted to have the airplane washed, and that can easily be a half day project. The Mooney was covered with dust, and all the control surface crevices were still filled with desert sand after sitting outside in the blowing sands of Walvis Bay. Handling agent "Sunny" (his anglicized nickname) offered to arrange the washing for the second day of my stay, and true to his word, he picked me up at my hotel for the trip to the airport to oversee the project. What a mess! Sunny had arranged with an airport official to let us wash the plane out on the ramp using a nearby garden hose as a water source. He had also recruited some of the airport fueling staff to actually do the work. There were at least six of them, although none seemed to know much about the meaning of work. After a few minutes of watching them splash soapless water on the plane and pronouncing it "clean" (it was still filthy), Sunny and I realized that we'd just have to do it ourselves. We persuaded one of the workers to go get us some detergent, and we grabbed a couple of sponges and started scrubbing. An airplane has many times the surface area of a car, and half of that surface area is down low, under the wing and fuselage belly. The job is tedious, but there are folks at most airports who pride themselves on turning a dingy flying machine into a glistening, museum quality airplane for a few well earned bucks. These guys definitely did not belong in that group! In fact, after about five minutes of Sunny, his driver and myself scrubbing away, the group's supervisor came over and became quite agitated, shouting in nonstop French to Sunny, and then grabbing the hose away from him and angrily shutting it off. Apparently we were encroaching on the team's coveted three hour lunch siesta time, and he wanted us to stop and leave so he and his crew could go home. [People of all ages in the Ivory Coast go home to nap from 12 noon until 3pm, returning then to school or the office to complete the remaining two hours left in their working day.] Sunny argued with him for awhile, and after some more heated discussion in rapid fire French, the hose reappeared and we finished the job. The others never lifted a hand, except to light their cigarettes and gesture in laughter at our labors. The coup de Gras came when we then asked them to do what they're supposed to be trained to do, i.e., fuel the airplane. They were by now in a decidedly great hurry to finish up, and fuel was spilled everywhere and the paint on one of my wings badly scratched as they crudely manhandled the heavy fuel dispensing spout around the plane, recklessly banging metal on metal. I was frustrated, but that frustration only got worse later in the afternoon when Sunny announced that his bill for handling my flight, transporting me to and from the hotel, and getting the airplane washed would be $1,500. And he would only accept it in cash! 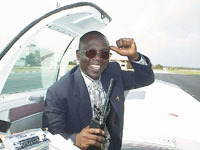 Realizing that he and his aircraft handling company were so well connected with the government officials at the airport that not paying him could be tantamount to me deciding on permanent Ivory Coast residency, I bit my lip and negotiated the rate down to a merely outrageous $1,200. Yes, Sunny did take me on a very pleasant two hour tour of the city earlier that afternoon, and yes, he did slide me through all the airport red tape with the speed of a hot knife cutting through butter, but this was simply Third World extortion! I had been charged large fees like this in India also, but in that case I had been forewarned by a number of sources to expect it, so I did. Here it really came as an unpleasant surprise. The flight from Sao Tome to Abidjan, Ivory Coast was a relatively short one, lasting only five hours. I was therefore able to conduct the entire flight in daylight, and for one of the only times on the trip I could take daytime photos upon my arrival. Here is the smiling face of the Abidjan-based ground handling agent, nicknamed "Sunny," who jumped right up onto the wingwalk outside the airplane door as I pulled up to my parking spot. 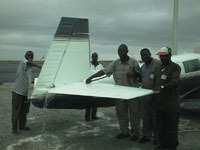 The airplane washing boondoggle that took place in Abidjan. These fellows are posing for the camera as if they're really working hard, but after a short period Sunny and I realized that the only way to really get the dirt off was for us to do the job ourselves, which we did. Not known by me at the time, the crew had been prepaid $200 in cash for their sloppy "nonwork," which was added to the hefty "handling" bill given to me. To add insult to injury, the crew managed to severely scratch the Mooney's new custom paint job on the left wing. In the States, a professional airplane washing, including belly and landing gear degreasing and interior vacuuming, costs less than $60. One very thoughtful thing that Sunny did do was to take me for a ride in the country outside Abidjan, where a large number of local craftsmen maintain tiny thatched roof shops where they both hand make and sell their goods as souvenirs to passing tourists. Here, I'm looking over some of the attractive offerings at one of the shops. 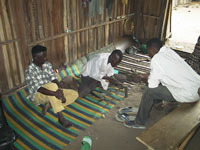 A craftsman fashioning a new knife for a couple of prospective customers. 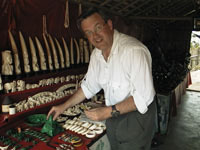 His entire shop was filled with home made knives, ranging in size from small penknives to large Japanese style swords. 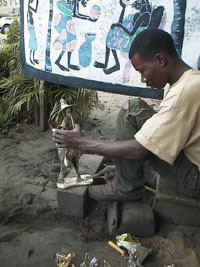 Two wood carvers plying their trade. 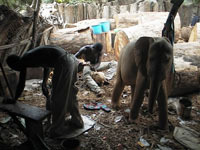 The large wooden elephant on the right had been whittled out of a single massive piece of mahogany. Given their cheap prices, I toyed with the idea of buying one of these cute pachyderms as an African souvenir for my family's living room, but Sunny convinced me that shipping it to the States would be prohibitively expensive. He should know! 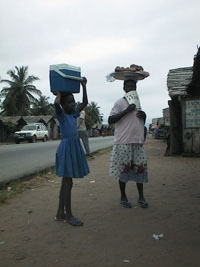 A mother and her daughter carrying supplies on their heads near one of the shops. 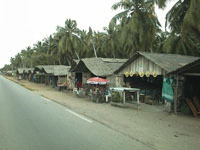 A few of the souvenir shops. These were lined up on both sides of this main road for almost a half mile. 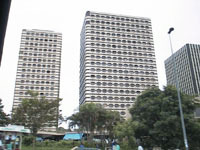 The proprietors pay a small fee to the local government as rent for their modest retail sites. The only shop I could find selling metal work. 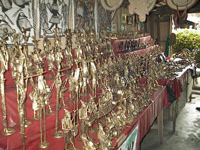 These are all hand tooled brass figures. A new brass figure in the making. 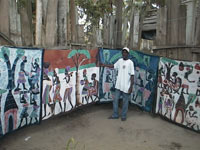 Hand painted table cloths for sale. 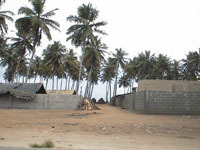 A typical fishing village along the Atlantic coast just outside Abidjan. Blessed with one of the only stable governments and reasonably viable economies in Western Africa, the Ivory Coast's capital city of Abidjan is a growing business center. Here are good examples of some of its modern commercial buildings. 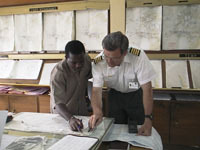 Here I'm getting a preflight briefing from an aviation meteorologist at Abidjan airport's "Met" office. The weatherman didn't speak a word of English, and my French would barely earn a passing grade at the grammar school level, so we communicated by gestures, scribbled weather symbols, and internationally recognizable charts. What could not have possibly been communicated between the two of us by phone (the way it's routinely done back in the States) was very effectively handled through this lively, person to person interaction. Bottom line. . .the weather between Abidjan and Sal, Cape Verde would be fine except for a clump of thunderstorms forming off Africa's west coast that I would have to avoid on my upcoming flight.